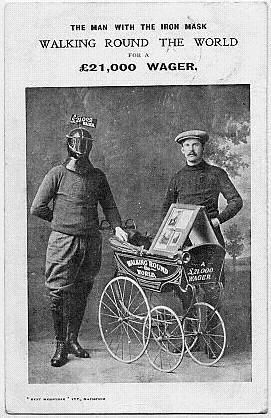 This postcard shows Harry in his mask (with attached banner) and his minder. The pram is the original one with solid wheels and thick spokes. The A-board has a collection of postcards that Harry sold on his journey to make money. 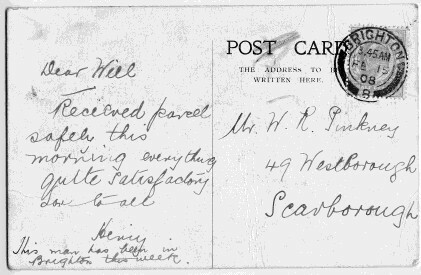 The message on the reverse of the postcard reads, "Received parcel safely this morning quite satisfactory. Love to all. Henry. This man has been in Brighton this week." The postage stamp indicates "3.45 AM FEB 15 1908, Brighton"
Thanks to Linda Culm for supplying the images of this postcard.